While individual injury and illness prevention has been a hallmark of the work of athletic trainers, many of the most pressing problems facing physically active children and adults require population-level approaches to maximize the effectiveness of prevention initiatives. In an effort to bridge athletic training and public health, the Athletic Training and Public Health Summit highlighted issues important to athletic trainers and introduced how a population approach has, or could be, used to promote preventive practices at the population level. “Athletic trainers are well-positioned in many of these problem areas to take leading roles in injury and illness prevention, but they may be unfamiliar with how to successfully incorporate policy development, policy assessment and large-scale translation to practice initiatives into their work to facilitate maximal impact,” says College of Public Health and Human Sciences Assistant Professor Marc Norcross, who served on the summit’s organizational committee. The summit was organized into three sections discussing topics of sudden cardiac death in athletes, sports-related concussion and osteoarthritis, with a focus on approach to policy and guideline development, policy and program evaluation and translation to practice. 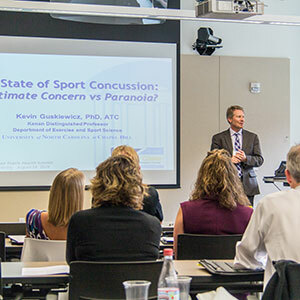 More than 30 leading experts in athletic training, sports medicine and public health attended the event, which featured nationally and internationally known speakers. 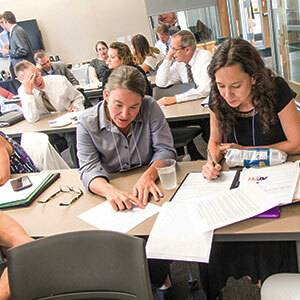 The group participated in networking events and a formal discussion on next steps and set an agenda for future work at the intersection of athletic training and public health. Summit sponsors included the CPHHS, the National Athletic Trainers’ Association, the National Athletic Trainers’ Association Research and Education Foundation, and the Datalys Center for Sports Injury Research and Prevention.